Whitechapel Gallery is barely recognizable at the opening of Elmgreen and Dragset’s latest exhibition This Is How We Bite Our Tongue. The gallery space becomes dominated by the sheer scale of their large installation Whitechapel Pool’, which demands attention from the moment of arrival, presenting itself as a spectacle and immersing the audience in its unique history. 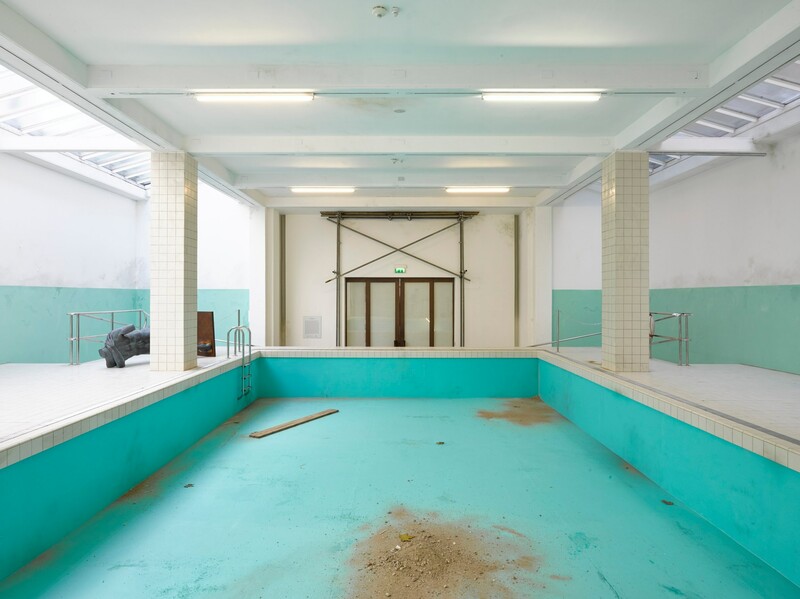 Built in 1901 yet reaching the height of its popularity between 1971-1976, the rich social history and cultural relevance of the pool and its annual 292,000 swimmers becomes apparent in this installation by Elmgreen and Dragset. Through their large scale reconstruction of the pool, the artistic duo elevate the great cultural relevance of the site, much like the ones before them such as David Hockney who found the inspiration for his first pool surface from there. Regardless of its vibrant past, the pool lost its public funding and was abandoned. It is however due to be renovated and reopened as a part of the Desert Flower Art Hotel & Resort Corporation. The rest of the exhibition features various smaller works; figurative sculptures that are of prevalence, alongside otherwise mundane objects such as Calvin Klein jeans strewn on the floor, urinals on the walls and an ATM positioned at the top of the stairs with an abandoned fake baby below it. This Is How We Bite Our Tongue is a must-see exhibition and a visit to the Whitechapel Gallery during Frieze week is strongly recommended. Strange Days: Memories of The Future is like a vivid dream; colourful, loud and filled with movement. 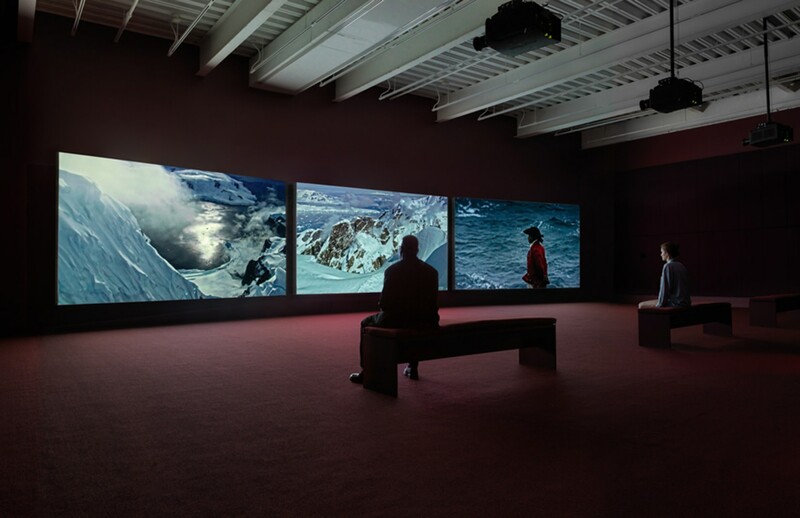 Co-presented by Store X and the New Museum are a collection of video and film installations from twenty-one leading artists. As implied by the name of the exhibition, a sense of obscurity and fragmented time runs throughout, although each artist creates a varied representation of the estrangement from normality. Each piece is brought to life on large, cinematic screens with high-resolution audio coming from speakers that engulf the viewer. Each room is dark, aside from the light projected from the images on-screen, so that the only focal point is the artwork itself. Whilst moving through the exhibition, which is also in collaboration with The Vinyl Factory, the visitor quickly becomes absorbed in the surreal environment that seems so far detached from the bustle of the Strand. Many viewers sit on the floor and lose themselves in the consuming visuals and sounds, until the ‘4th Floor to Madness’ piece by Pipilotti Rist invites viewers to lay on beds and watch the instillations come to life on the ceiling. All sense of time is truly lost in the exhibition as the viewer travels from one room to another, one reality to another and one dream to the next. Art lovers will not want to miss this one-of-a-kind experience. Oliver Malingue presents an ambitious exhibition centred entirely on hanging sculpture; such abstract, suspended art will be featured from fifty talented contributing artists and will certainly offer something different to the typical canvas against a white wall format. The collection, in which the sculptural displays span from the early twentieth century until the present, has been curated by Matthieu Porter. Beginning in London and later travelling to the prestigious Palais de’Irena in Paris, the exhibition will take viewers on a journey of the diverse history of hanging sculptural forms. Although the Paris exhibition is set to be larger than its London counterpart, featuring esteemed artists such as Yves Klein, Ernesto Neto and Alexander Calder, both locations promise an eclectic mixture of influential older pieces among more recent contemporary sculptures. 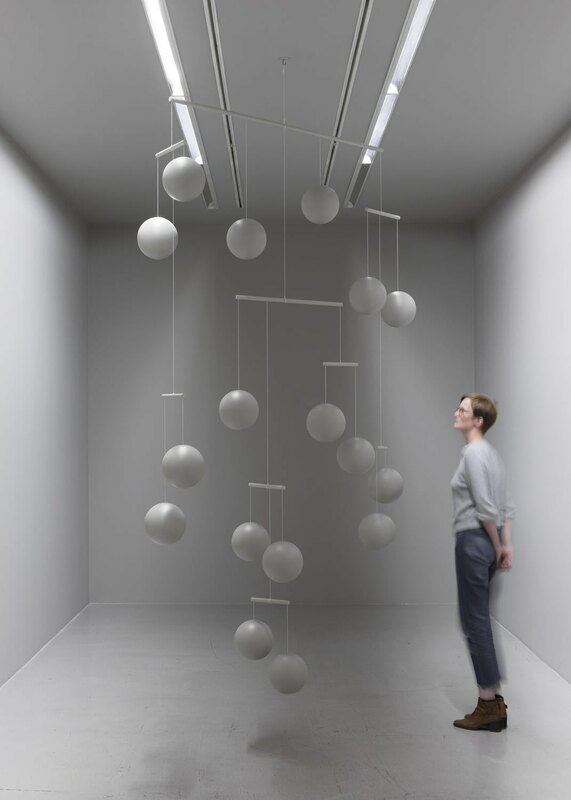 Oliver Malingue opens Suspension: A History of Abstract Hanging Sculpture 1918-2018 for Frieze week, an exhibition which is sure to offer something interesting and alternative to all who attend.